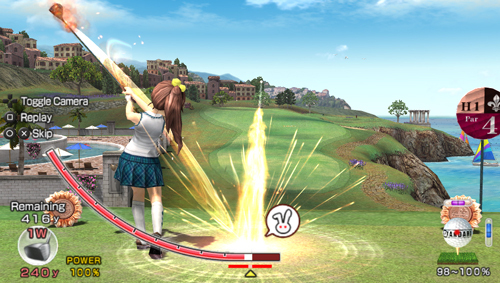 PlayStation is releasing the latest instalment of Everybody’s Golf as part of the PS Vita launch on 22 February. The PS Vita is wifi enabled and has the ability to connect to the internet via a 3G network. This means Everybody’s Golf will have a variety of online game modes aside from the standard strokeplay and matchplay single-player modes. As well as being able to play against friends in a series of in-turn challenges, gamers will also have the chance to play in real-time live tournaments on the PSN network. Built-in stereo speakers and a microphone allow you to communicate with friends while you play. The five-inch touch screen and 360-degree viewing feature on the new PS Vita will impact heavily upon the gameplay in Everybody’s Golf. The 360-degree view gives you the ability to plot your route to the pin, while the touch screen enables you to physically move your player at address to where you want them to be positioned for each particular shot. PS Vita’s built-in video cameras and GPS device have also been developed to help create an augmented reality world for a truly immersive experience when playing the game.